Average wide-slit spectra of WD1145 (blue) and the reference star (red) obtained with GTC/OSIRIS. The He i and Fe ii absorption features of WD1145 are marked with purple and green vertical lines, respectively. The principal telluric absorptions lie within the light-grey shaded areas. Both average spectra have been normalized. Credit: Izquierdo et al., 2018. An international group of astronomers has conducted a study of a peculiar white dwarf known as WD 1145+017 that showcases periodic transits of planetary debris. The new research, presented in a paper published August 22 on arXiv.org, determines fundamental parameters of this object and provides essential insights into the nature of debris around it. Located some 570 light years away, WD 1145+017 (or WD1145 for short) is a white dwarf about 2 percent the size of the sun, with a mass of about 0.63 solar masses. In 2015, astronomers detected periodic transits from debris encircling this star, which made it the first known white dwarf with a transiting planetary-mass object orbiting it. Subsequent observations of WD 1145+017 provided evidence that the mysterious object orbiting this white dwarf every 4.5 hours is an asteroid being shredded apart by the star. However, more studies of WD 1145+017 are needed to determine the real nature of the debris. That is why a team of astronomers led by Paula Izquierdo of the University of La Laguna, Spain, has carried out the first simultaneous fast optical spectrophotometric and broad-band photometric observations of WD 1145+017. For this purpose, they employed the Gran Telescopio Canarias (GTC) and the Liverpool Telescope (LT). 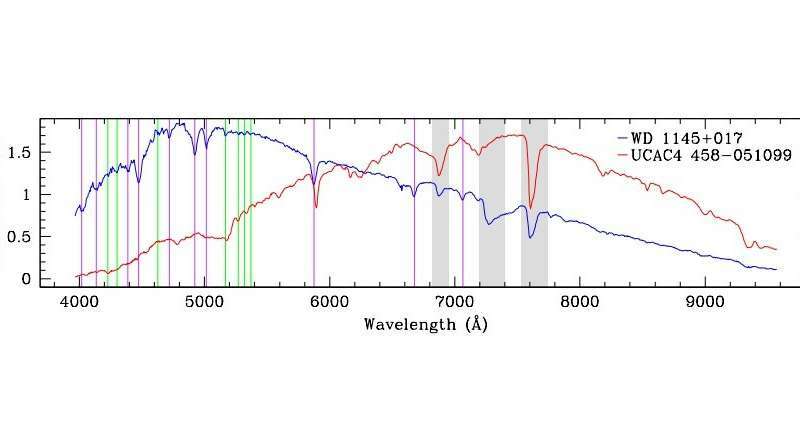 "Here, we report the first simultaneous spectroscopic and photometric study of WD1145, obtaining fast optical spectrophotometry and photometry using two different telescopes," the researchers wrote in the paper. According to the study, GTC and LT observations suggest that the mysterious object around WD 1145+017 could be a comet being disintegrated by the white dwarf. The deep transits observed by Izquierdo's team show a remarkable delay in the egress compared to their ingress times. The researchers noted that this is consistent with a scenario of a comet-like tail emanating from the fragments. Moreover, the deepest transit indicates a substantial substructure near minimum light. The astronomers explained that such structure could be caused by a closely spaced chain of rocky fragments, similar to the debris stream of the comet Shoemaker-Levy 9 that broke apart and collided with Jupiter. However, it could also be caused by a debris cloud extending 120 degrees in azimuth with an inhomogeneous density structure. "The longest (87 min) and deepest (50 per cent attenuation) transit recorded in our data exhibits a complex structure around minimum light that can be well modeled by multiple overlapping dust clouds," the paper reads. The authors of the paper added that time-resolved spectroscopy with a higher signal-to-noise ratio could be helpful in disclosing more details about the white dwarf and the debris surrounding it. In addition to the investigation of the nature of the object orbiting WD 1145+017, the astronomers also determined the basic parameters of the white dwarf, including its mass, effective temperature (15,020 K) and cooling age (224 million years). Their results are consistent with the values provided by previous observations of this system. WD 1145+017 is currently the only white dwarf known to exhibit periodic transits of planetary debris as well as absorption lines from circumstellar gas. We present the first simultaneous fast optical spectrophotometry and broad-band photometry of the system, obtained with the Gran Telescopio Canarias (GTC) and the Liverpool Telescope (LT), respectively. The observations spanned 5.5 h, somewhat longer than the 4.5-h orbital period of the debris. Dividing the GTC spectrophotometry into five wavelength bands reveals no significant colour differences, confirming grey transits in the optical. We argue that absorption by an optically thick structure is a plausible alternative explanation for the achromatic nature of the transits that can allow the presence of small-sized (∼μm) particles. The longest (87 min) and deepest (50 per cent attenuation) transit recorded in our data exhibits a complex structure around minimum light that can be well modelled by multiple overlapping dust clouds. The strongest circumstellar absorption line, Fe II λ5169, significantly weakens during this transit, with its equivalent width reducing from a mean out-of-transit value of 2 AA to 1 AA in-transit, supporting spatial correlation between the circumstellar gas and dust. Finally, we made use of the Gaia Data Release 2 and archival photometry to determine the white dwarf parameters. Adopting a helium-dominated atmosphere containing traces of hydrogen and metals, and a reddening E(B−V)=0.01 we find Teff=15020±520 K, logg=8.07±0.07, corresponding to MWD=0.63±0.05 M⊙ and a cooling age of 224±30 Myr. The star rotation speed is directly related to the height of the temperature, the radius, the surface gravity, and the color of the star. Higher speed = higher temperature, smaller radius and higher surface gravity. Contrary to low rotation speed = low temperature, large radius (mass / radius), and small surface gravity.